Every time I cook I always change something up, use something different. Cooking is an art form and should reflect how you are feeling. Feeling spicy? Add some cayenne. Feeling warm and comfy? Make some chili Feeling misunderstood? Use that can of sardines! 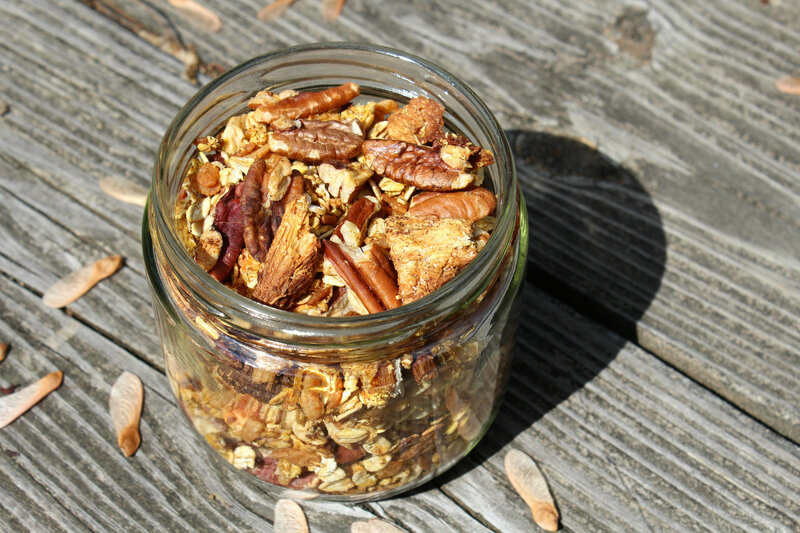 Granola is something that you can truly turn into a magic creation of everything. Just throw a bunch of ingredients in a bake. Now I like to have a general theme and I had been wanting to make some carrot cake granola for awhile now. I had this recipe in my head for months, but for some reason it kept getting delayed. But maybe that is a good thing this time. I really had time to think about it, and when I did go to pick up the ingredients to make it and actually stand at the counter mixing everything together, I really had the recipe gods working their magic. This granola is not your ordinary carrot cake granola. It is so much more! It is tropical, buttery, perfectly sweet, and nutty. Pineapple, Coconut, Pecans, Oats, Millet, Brown Rice, Carrots. Eating a bowl of this magic mix really makes me feel like I am eating the greatest carrot cake. I was surprised actually. I had no idea how this hodge-podge of ingredients would truly come out in the end. I thought it would be to carroty, I thought the pineapple would ruin it. Well once again I was proven wrong. Thankfully I went with mu gut and didn’t use my original plan when making this. So of course the only thing left is to share it with you. Take your recipe ideas and inspirations and get in the kitchen and make them more than! + Preheat oven to 325°F. + Combine all dry ingredients in a large bowl and stir to combine. Then add all wet ingredients and stir again until everything is coated and mingled. + Line a baking sheet with foil and lightly oil it. Then spread the granola mixture evenly on the pan (not a big mound, or it won’t bake right). + Bake for 30 minutes, stirring every 10 minutes. Remove from the oven and let cool before storing in an air tight jar or container. + Do you “cook” recipe in you head before you make them, do you like to write things down, or do you just wing it? + What is the last recipe you made that came out better than expected? What a great snack for my family to take on our spring/summer hikes here in Alaska. 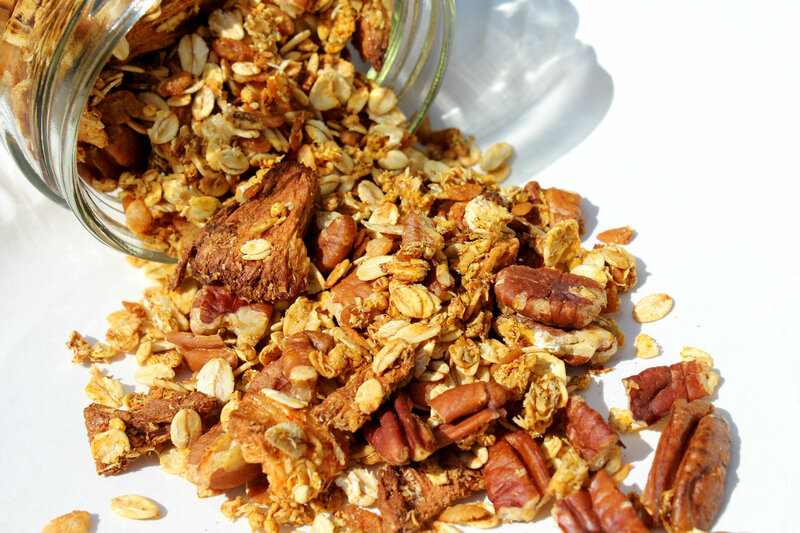 Granola is always a great snack! I am always looking for different kinds of granola. I just love coming up with new combos! YUM!!! This looks absolutely amazing! My son would love this! Your grandmother is a wise woman 😉 The best cooks don’t! Yum! I like carrot cake, never thought about making it a granola. This is one to try! Of course as a granola! oh anything carrot cake is perfect this time of year!! Plus I absolutely love granola! Same 😉 Can’t get better! Haha, yes! Things are just always made a bit different everytime! Congrats. 😉 This was the most viewed link on Savoring Saturdays! Hope you’ll come share again this weekend! 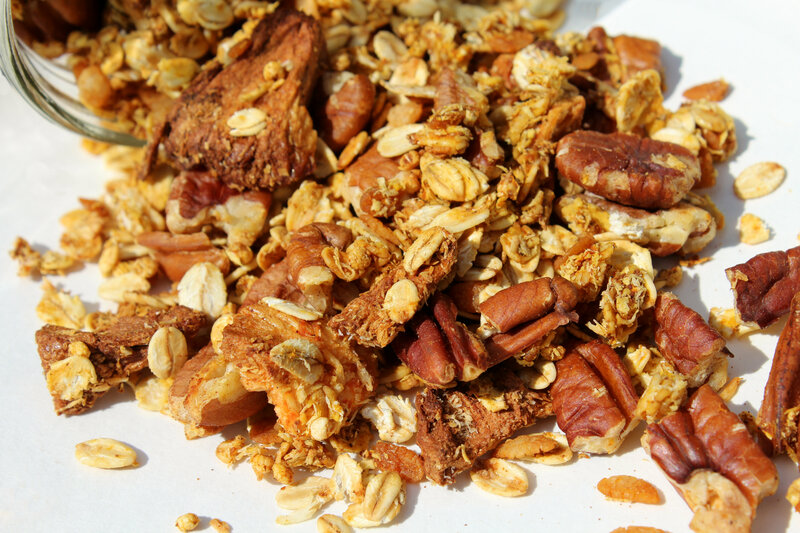 You can never have too many granola variations in your bag of tricks – this looks like a great version! Thanks Danielle! 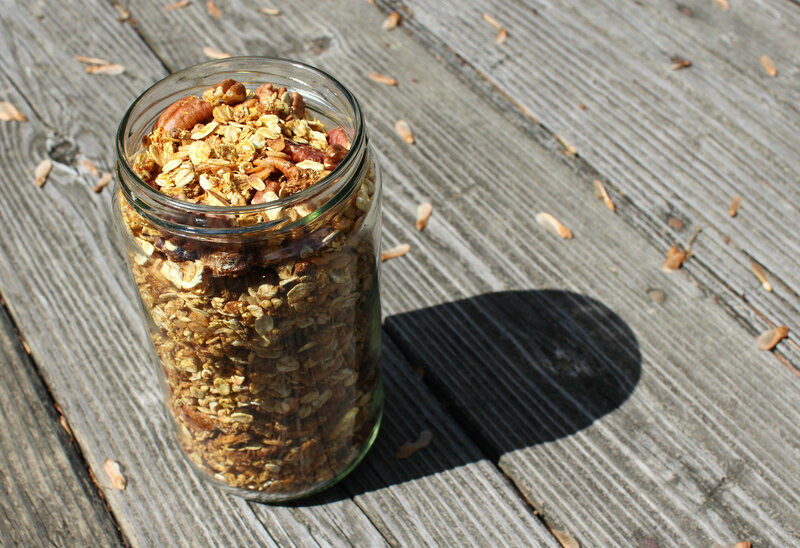 I love making my own granola. But I just ran out and ran out of oats this week so I had to place an order and I don’t know what I’ll do with out granola for the next few days! Thank you for sharing with us on AFW. I’m featuring your recipe this week. And oh yes, I usually *cook* up a recipe in my head before hand. I dream about food. Ha ha. Carrot Cake is one of my favorites – I saw a granola version in Whole Foods but couldn’t force myself to fork over the money. This is perfect! I love this recipe – what a healthy and tasty ingredients. Thanks for sharing on Real Food Fridays Blog Hop. Great snack for kids. 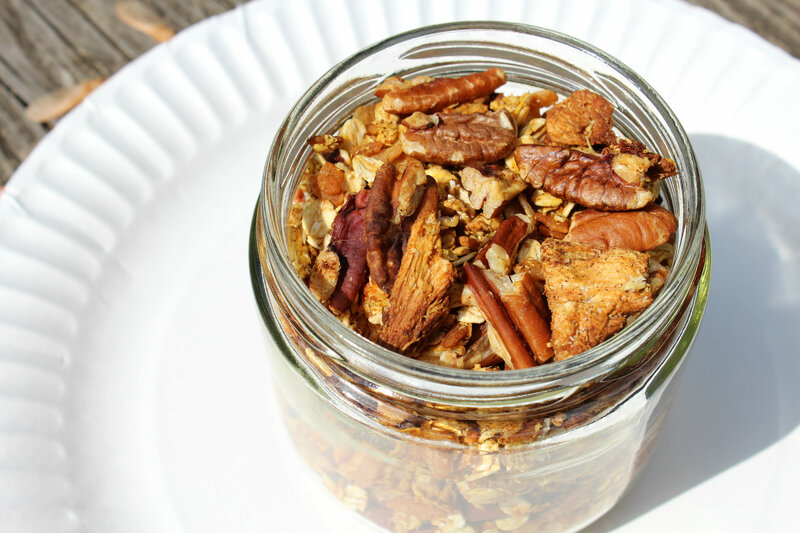 I love granola and this one looks fantastic! I will have to try adding Stevia to my granolas to help cut down on those bad sugars. I too never follow a recipe and actually improvise as I go. The last recipe that surprised me was one I will be posting soon, a banana upside down cake, that wound up having a taste similar to Tortuga Rum Cakes. Thanks for sharing on Gluten Free Fridays. But I can’t wait to see that recipe! Sounds phenomenal! What a delicious mix of ingredients, that certainly sounds like one to try out! Thanks for linking up to #TastyTuesdays, I’ve pinned this on to the Tasty Tuesdays Pinterest board too. It all works fabulously together! 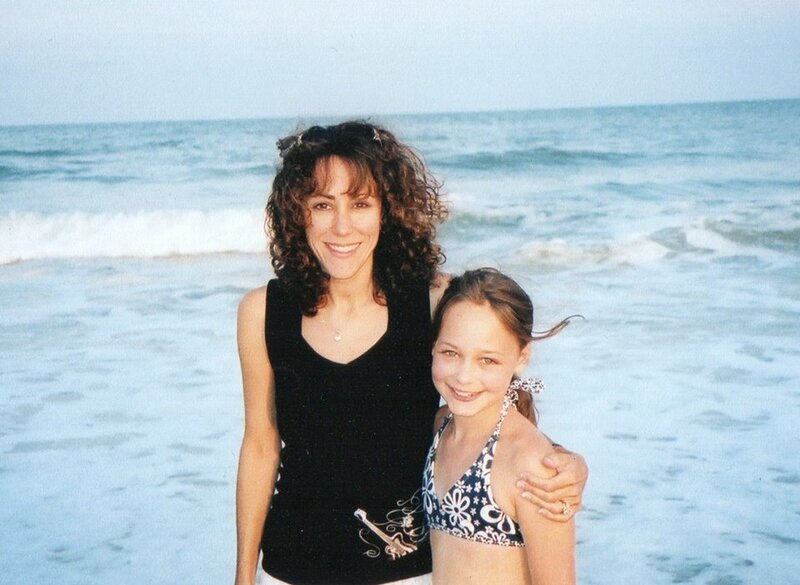 Happy Birthday to your momma!! That picture is so cute!! This looks great! I love carrot cake and would have never thought to put carrot cake puree in oats. Thanks for the idea! Happy birthday to your mom! I cook on the whim as well and rarely make anything exactly the same way. And I think that really is the best way to cook 😉 It keeps things interesting! 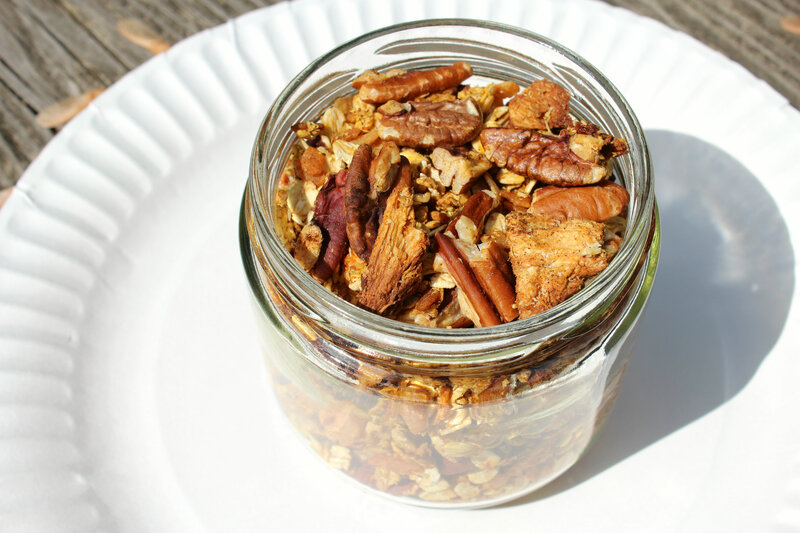 That granola looks delicious–I love the combination of spices that you used, and the freeze-dried pineapple must add a nice touch as well. 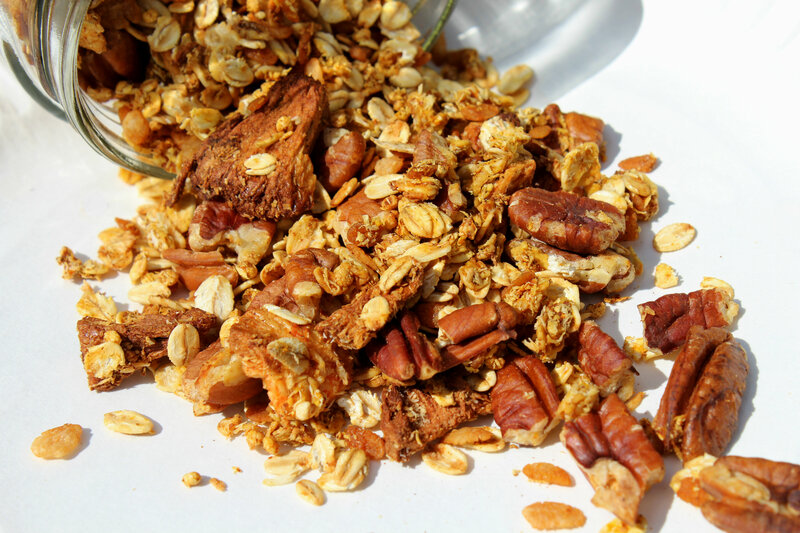 I’ve never thought of using dried pineapple in granola before, but it’s a great idea! I frequently create recipes in my mind as well, usually based on what we have in the fridge or pantry that needs to be used up ASAP. However, like you, I often just “wing it” when it comes to the exact amount of ingredients, and I rarely make a single recipe (even the ones I created) the same way twice! I am constantly tweaking, adding, subtracting, and substituting ingredients, depending on what we have available and what I feel in the mood for at that precise moment. I hope you have a wonderful day! I always used freeze dried fruit in my granola! It has no added sugar is already has a nice subtle crunch to it! I need to remember to not look at your blog until after lunch. Looks so yummy! I always make granola for my hubby and like experimenting — this carrot cake take looks like a winner — will try! looks AWESOME! love me some granola! Love this low sugar idea! Low sugar granola is harder to find. I love me some carrot cake! Must try!